Offering you a complete choice of products which include reaction vessel. 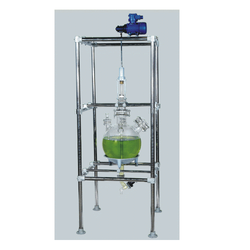 Our company has established itself as a leading manufacturer of superior quality Reaction Vessel in the market at present. It is a stirring unit used in laboratories and comes with outer jacket through which a temperature controlling medium can be circulated (maximum temperature of 200°C). It is made up of a material that is grease free and resistant to chemical attack and is provided to the customer at reasonable rates.